In past article I’ve written about some basic stuff we can do with Ethereum client Parity – like transfering Ethers, creating multi-signature wallet and even writing our own contracts. Now I’ll continue with writing our very own Distributed Application ( Dapp). For UI part we use Aurelia (as I have played with Aurelia framework before, so this is good opportunity to refresh knowledge), Bootstrap 3 and web3.js for communication with Ethereum client. The resulting code is here in github. Web application packing – as several times before correct packing of web application was problematic. Finally web3.js worked correctly with webpack bundled application generated with Aurelia CLI and using recent version (3.5) of webpack. Web3.js version – initially I started with latest beta version (1.0), but it does not seem to be ready yet, documentation is brief and I was missing some functionality or it was not working properly, so I finally used stable version 0.20. This is a pity, because 1.0.0 has much modern interface, using Promises etc. Client must know address of the contract (contractAddress) and its interface (contractABI). As I do prefer to work with promises rather then callbacks, there is an utility function toPromise that converts callback to promise. Call is evaluated locally with web3.eth.estimateGas – it executes contract method in local EVM. More important then knowing consumed gas is the fact that call executes without problems. If we do not check this now, we can easily send transactions that will fail ( for instance trying to register already registered name), but even such transactions are sent out and included in blockchain. This early check prevents such problems. Send out signed transaction – this step requires cooperation of Parity wallet, were transaction has to be signed. Get notification that transaction was included in the blockchain. Method web3.eth.getTransactionReceipt can return null, if there are not enough new blocks confirming our transaction ( to be reasonably sure that transaction is not in the orphaned block), so we have to try several times until receipt is available. Method addListener enables to listen to Register events and update application about recently registered names. You can check for instance this Parity Dapp tutorial – which is focused particularly on Parity’s special libraries integrating with React. I went through it (with some issues, partly related again to web application packaging) and it’s really nice. Parity libraries provides cool reactive components – like TransactButton button, which visualizes transactions steps. Such components can significantly speed up and simplify application development. We only scratched surface of distributed applications development, real applications are indeed much more complex, with numerous cooperating contracts in blockchain, dynamically created contracts etc. But it’s first step and it’s not very difficult – web part is basically regular web app development with one additional library – web3.js and few gotchas – especially around sending transactions out. Smarts contracts language Solidity is also relatively easy to comprehend, but as we’ve shown in previous articles it can be deceiving and one can make fatal errors, which make distributed application vulnerable. 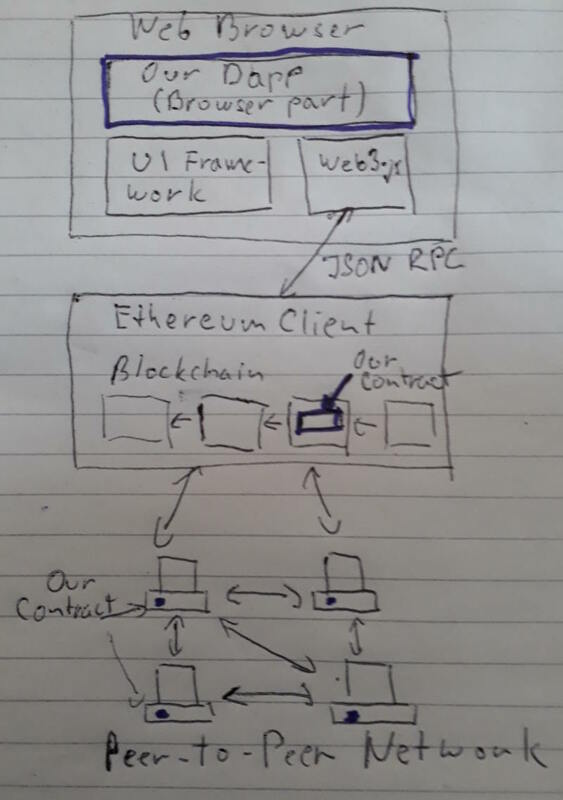 Security review of contracts based of solid understanding of Ethereum blockchain is a must for real applications.